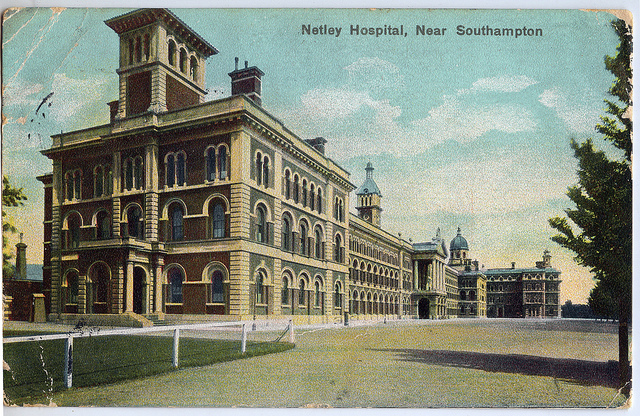 Royal Victoria Military Hospital Netley | Samuel K. Parish, M.D. The once majestic RVMH. The final demolition occurred in 1966. For those interested in a bit of medical history, especially military medical history, check out my recent article published in Hektoen International: A Journal of Medical Humanities. The story of the Royal Victoria Military Hospital spans more than 100 years, several wars, and thousands of lives of veterans and health care workers. This entry was posted in Miscellany, The Blind Caduceus, The Medical Life and tagged A Study in Scarlet, Arthur Conan Doyle, Crimean War medical, D Day, Florence Nightingale, Military Medicine, Netley, Royal Victoria Country Park, Royal Victoria Military Hospital, RVMH, SHAEF, Wilfred Owen, WWI, wwii. Bookmark the permalink.